The 2016 Dominic Anthony Marrocco Southern Nevada Business Plan Competition is down to 10 semifinalists. Five of the teams will advance to the final round on April 29, 2016. The seventh annual competition is run by the University of Nevada, Las Vegas Center for Entrepreneurship in partnership with the Las Vegas Business Press. It is underwritten by Dominic Anthony Marrocco, an honorary fellow of UNLV’s College of Engineering. The top five scoring plans advance to the finals round, where principals will pitch their business plans to judges for the chance to win a share of cash and prizes to help launch their businesses. Last year, MovéoMedics, a company consisting of UNLV students and faculty members, took the top prize for SmartOrtho Detect, a shoe insole system that helps diagnose the earliest stages of diabetic foot problems. The competition started Feb. 26, 2016. An original field of 18 teams has been narrowed to 10. 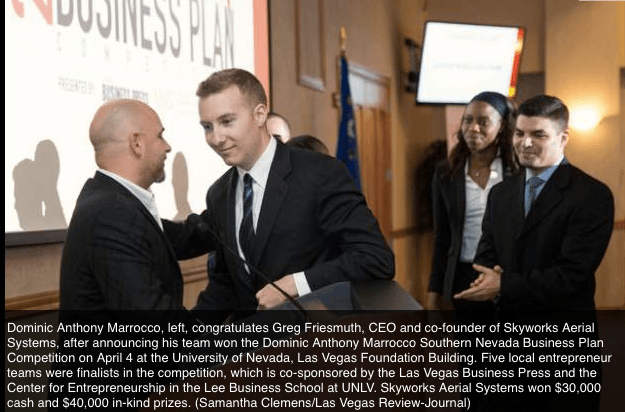 Read more about this competition, view the list of finalists, and learn about the ceremony to announce the business plan winner in Ann Friedman’s Las Vegas Business Press Article!